Meet a friend of mine, an author with a great book. Paul Rega is president of a retained executive search firm and a professional recruiter with over twenty-seven years of job hunting and career planning experience. 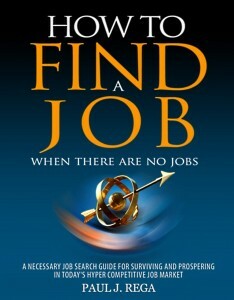 His provocative new book, How To Find A Job: When There Are No Jobs strikes a nerve with millions of displaced workers and goes well beyond the principles of job hunting. Paul introduces a revolutionary concept in career management and personal development called “Intuitive Personal Assessment.” He takes his readers on a powerful journey as he tells a gripping story about his own career and the challenges faced as an executive recruiter, often fraught with personal tragedy. This is a must read for anyone who is looking for a new job or wants to change careers in the worst economy since the Great Depression.